Hey, I’ve been following your blog for a while now (for art references mostly! it’s a really great resource) and it was such a nice suprise to find out you’d updated today! The kirtle ended up looking really nice! It looks great! I’m not great at sewing myself, and I’m very impressed with what you’ve done. I especially like the cloth buttons and…the colour green! I’ve been thinking about that and I think it would have been an expensive dye indeed. Also, as you surely know, some colours were forbidden to use in the working classes. 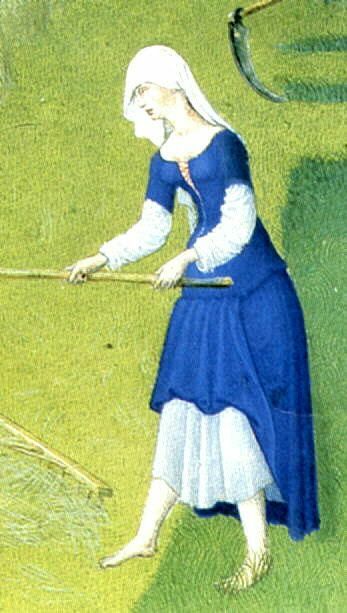 I’ve done medieval studies and from what I recall, farmers could only wear more modest colours, like black, grey or brown. A grayish kind of blue would also have been possible, but not the bright blue that was reserved for noblemen only. Therefore I think what you see on the pictures you are showing here could be explained as follows: I think the farmer woman could have worn a grayish-blue dress, but it might not be accurately painted in the manuscript (too bright). Getting those colours right was very tricky! The lady in green on the other picture might not be a farmer’s wife, but actually a noblewoman. I know she is not wearing a more elaborate outer dress, but the choice of green could be indicating her status, as well as her surroundings. She is being held in a place with a stone pillar and expensive floor tiles. Whatever story is portrayed in this miniature, I don’t think the lady is of low rank (farmers would be thrown in the brig ;)). Do you know from which manuscript this miniature originates? It would be interesting to find out! Anyway, I hope my thoughts on this subject are helpful. Thanks for sharing your great handiwork! Thanks, and thanks also for your thoughts!